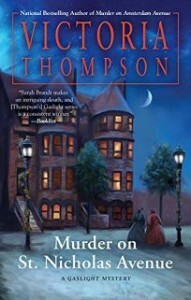 The Malloys are away on their European honeymoon but that doesn’t mean that their assistance isn’t needed to help clear a young woman of murder. Maeve, the couple’s nanny who’s often gotten involved in investigations, decides that she can help Mrs. O’Neill clear her daughter of murder. Una Pollock was found cradling her husband who bludgeoned to death. She can’t remember anything so the police take her into custody and it is assumed that she did it but as Maeve starts to dig into Una’s life by talking to the servants she thinks that Una may not be responsible for the murder. Soon Gino Donnatelli, a policeman and friend of the family, is involved in the investigation as are Sarah’s parents, the high society Deckers. Between the four they uncover that the beautiful Una may actually have had a reason to kill her abusive husband and that her husband had his fair share of enemies. I found Una to be a complex character. One minute she’s a demure widow who’s been through a lot and can only resort to her tears and beauty to garner sympathy but the next you realize she’s up to something. So I actually liked reading about her. Unfortunately this book really missed the mark for me because of the lack of Sarah and Frank. Those two characters and their interactions are what keep me coming back so to have them absent from most of the book is a disappointment. I did like Gino and Maeve and like where their storyline is headed although not surprised by that development, but I’m looking forward to the next adventure to see how the Malloys will face their future now as a married couple and with crimes to solve. I am sorry this one didn’t live up to your expectactions. I liked the sound of it, and Una seems like such an interesting cahracter. One of the members of my mystery group loves this series. I keep meaning to try it. Must remember to do that. Is this the book you are discussing with your group? The premise sounds interesting. It was a disappointment that there was a lack of some characters, though. Characterisations definitely play a big part in a story, even if their roles are minor. This is one of my really must get to authors. I know what you mean by being disappointed however when regular characters are left out of a new addition to a series!